This will be my last post for awhile. The links along the right side bar of the page should still be helpful. Hope to be back at some point in the future. Here is an invitation from CaringKind if you are interested in attending. “Recently there have been some exciting technological advances that may enhance the quality of life for people with dementia and their care partners. 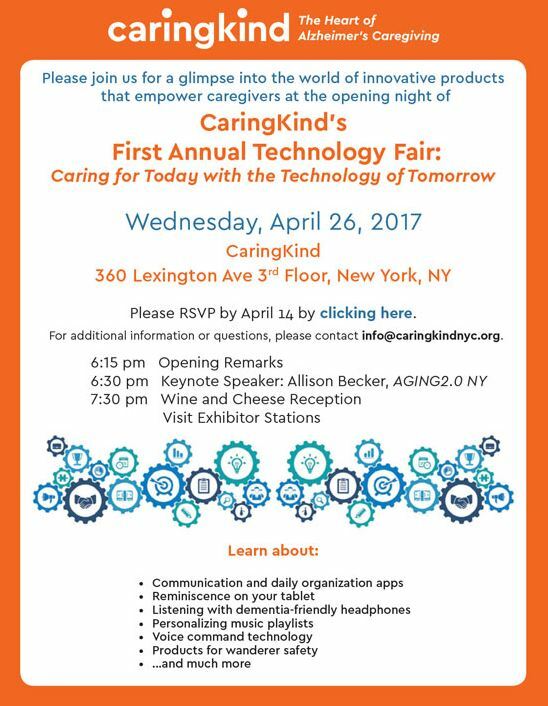 Please join us on Wednesday, April 26th as over a dozen exhibitors showcase their ideas and products at the opening night of CaringKind’s first annual Technology Fair. Space is limited. This is information that you can share with an MD as you are going through the diagnostic process if there is uncertainly on the part of the MD. Cancelled due to the snow storm on March 14th, Maplewood at Stony Hill in Bethel has reshceduled its educational seminar for both professionals and personal caregivers about FTD. 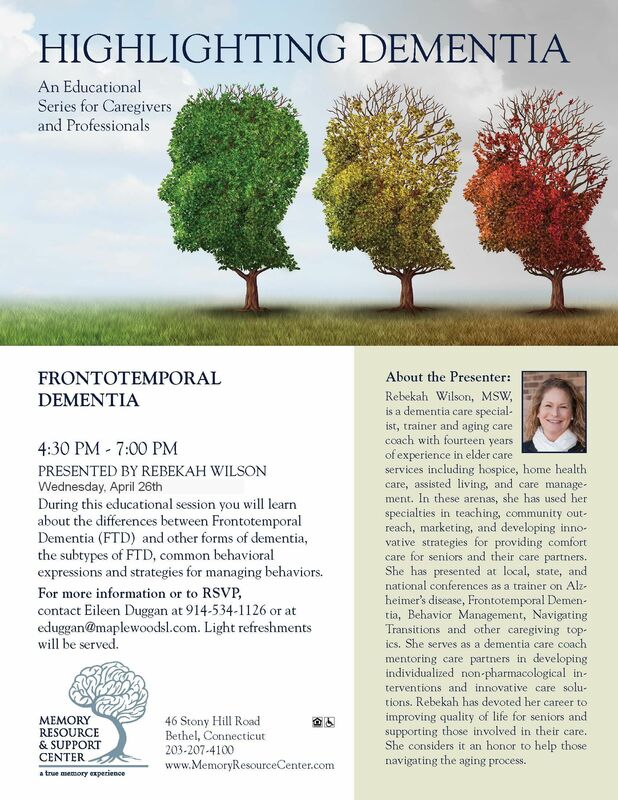 During this educational session you will learn about the differences between Frontotemporal Dementia (FTD) and other forms of dementia, the subtypes of FTD, common behavioral expressions and strategies for managing behaviors. For more information or to RSVP, contact Eileen Duggan at 914-534-1126 or at eduggan@maplewoodsl.com. I’ll be presenting and demonstrating the approach I developed to use the iPad with my wife at the Alzheimer’s Education Conference on April 6th in Cromwell, CT. It is an accredited course for healthcare professionals and open to family caregivers. Ed Fitzgerald’s wife Diane was diagnosed with Frontotemporal Degeneration (FTD) in 2010. Using his technology experience, he developed an approach to using the iPad to keep her engaged and mentally stimulated, which is what he will talk about here today. During this seminar, Ed will talk about how he uses the iPad with his wife and the process by which he created a customized set of activities that are of interest to his wife. He will offer advice on how to proceed if someone is interested in pursuing it with their loved one. He also talks about getting other family members involved and the benefits to both the loved one and caregiver. While he uses an iPad, some of what he talks about applies to other tablet devices as well. You don’t have to be a techie to benefit from this seminar. Apps recommended for those with dementia, games, videos, audio, music, news, photos, etc. How it can be used in a group setting in an assisted living facility, nursing home or senior center. Register at the Alzheimer’s Education web site. The Effective Communications Strategies program explores how communication takes place when someone has Alzheimer’s disease: learn to decode verbal and behavioral messages and identify strategies to help connect and communicate at each stage of disease. Join Shanon Jordan, South Western Regional Director of the CT Alzheimer’s Association, on March 29, 2017 from 12:00-1:00 pm at Brookdale Wilton, 96 Danbury Road, Wilton. Contact Christy Perone, 203.761.8999 to register.